1. A mummy-shaped sleeping bag densely packed with lightweight down to keep you a warm and happy camper. 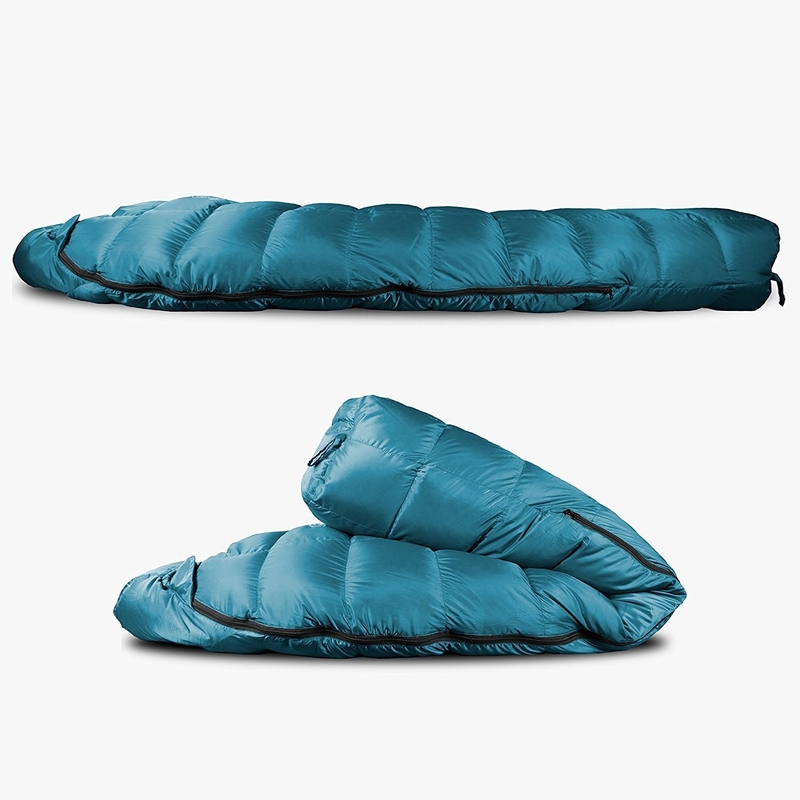 This down sleeping bag is great to use as a three-season bag; it’s designed to keep you warm in temperatures as low as 20°F (note: these ratings are simply suggestions — it all depends on what your body temperature is like). It’s insulated with 800 fill power duck down (fill power measures down’s fluffiness and insulation power — a higher fill power means fluffier/warmer down; fill power typically ranges from 300-900, so 800 is pretty great) but only weighs 2.5 lbs. and can be compressed down to 10″x8″. It uses ripstop fabrics treated with a water-repellant coating and YKK zippers (which are known for durability) and comes with a compression sack for easy packing. The regular model opens up to 75″x31″ and is designed to fit a person up to six feet tall. Price: See pricing here (available in three sizes and two colors). 2. A rectangular sleeping bag lined with cotton flannel that’s as soft as your sheets at home. 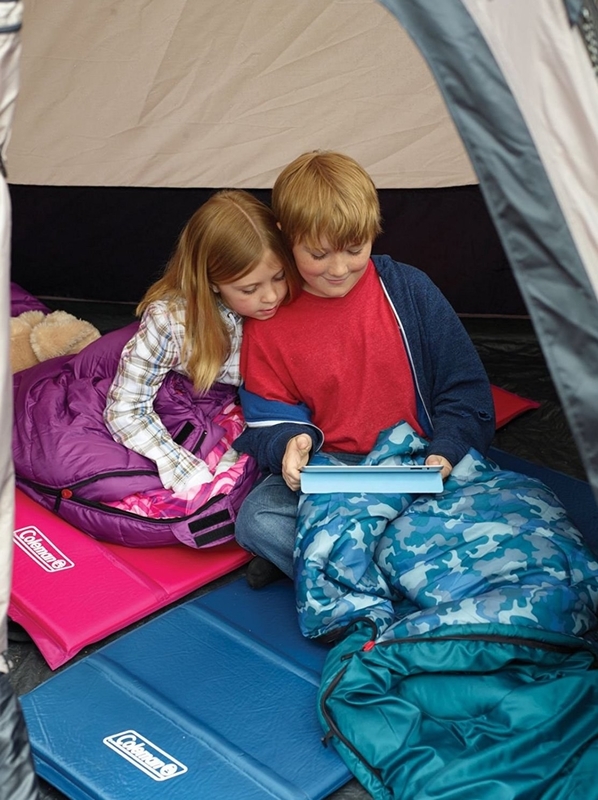 This sleeping bag opens up to 75″x33″ and can fit adults up to six feet tall. The exterior is made of waterproof polyester ripstop fabric, while the inside is lined with cotton flannel. It’s suitable to use in a temperature range of 23-41°F but will be most comfortable around 32°F. It can be compressed down to 17″x8″x8″ and weighs around 4.6 lbs. It also comes with a compression sack for storage. 3. 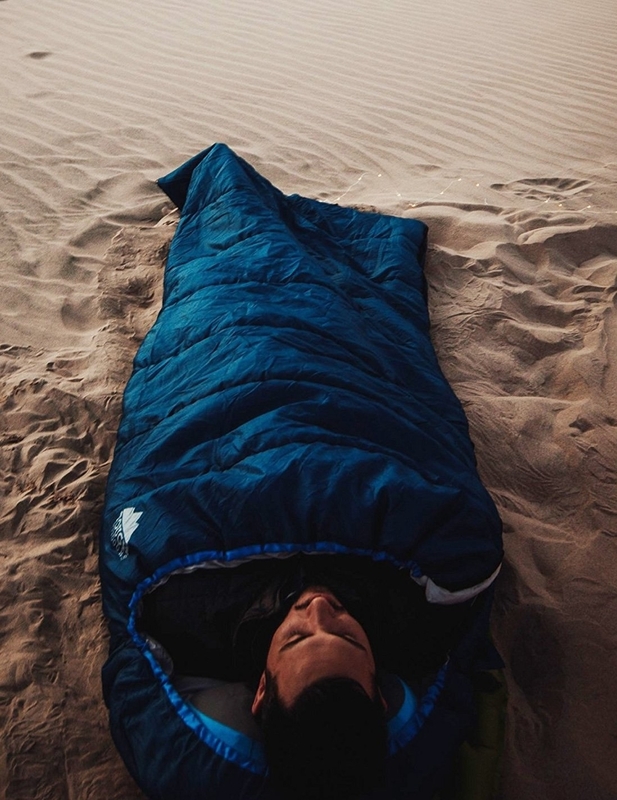 An ultra-compact warm-weather sleeping bag for when you need to pack light. 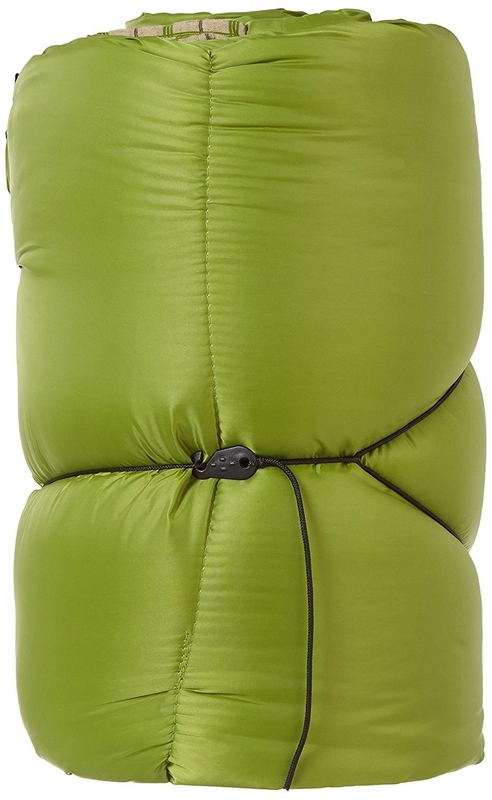 This sleeping bag only weighs 1.72 lbs. and can be folded down to 4.7″x11.4″ (75″x34″ when opened). It can be used in temperatures no lower than 48°F and will feel most comfortable around 59°F. It has a water-resistant nylon shell and 100% polyester filling. It comes with a compression sack. 4. A fleece-lined sleeping bag set that’s sure to make the other kids jealous at a sleepover. 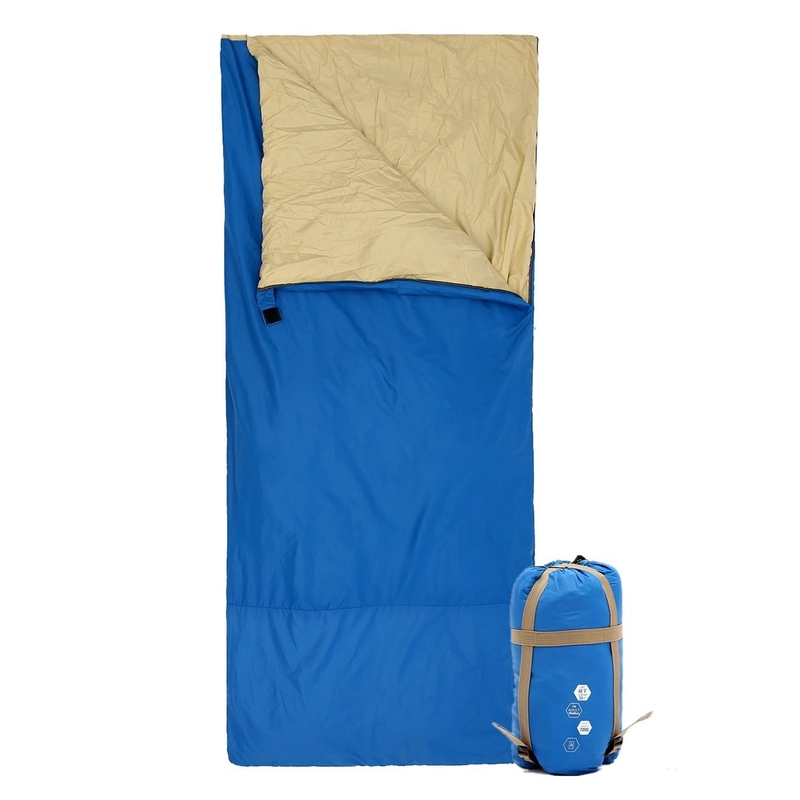 Each set comes with the sleeping bag (66″x32″) and a matching fleece pillowcase (20″x26″). The bag is made from microfiber polyester lined with fleece and has straps attached for easy carrying. Everything is machine washable. 5. 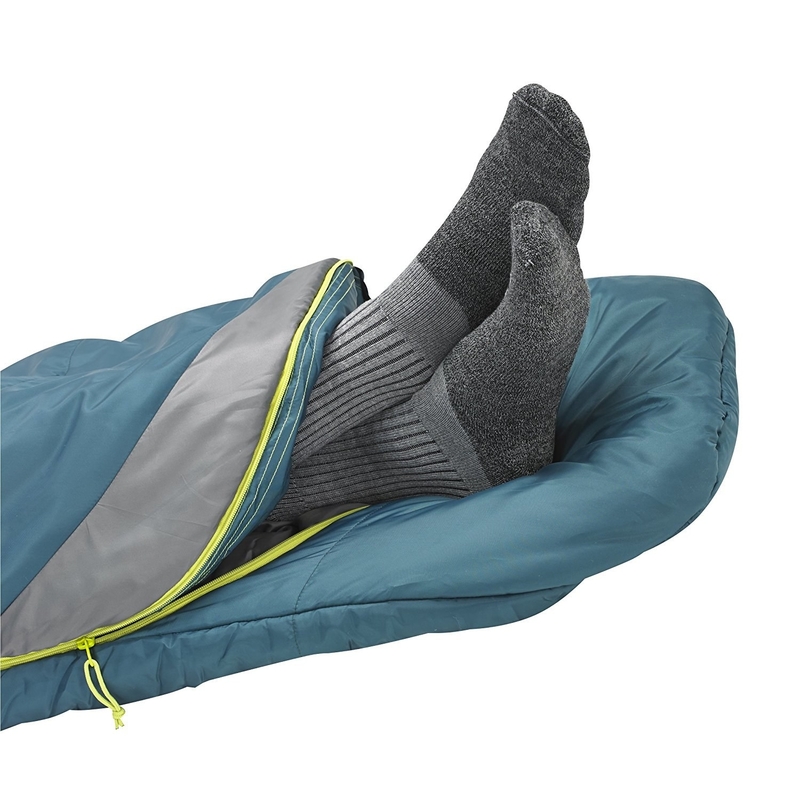 A cool-weather sleeping bag with a zippered vent at the bottom, so you can poke your feet out if it gets a little too warm. 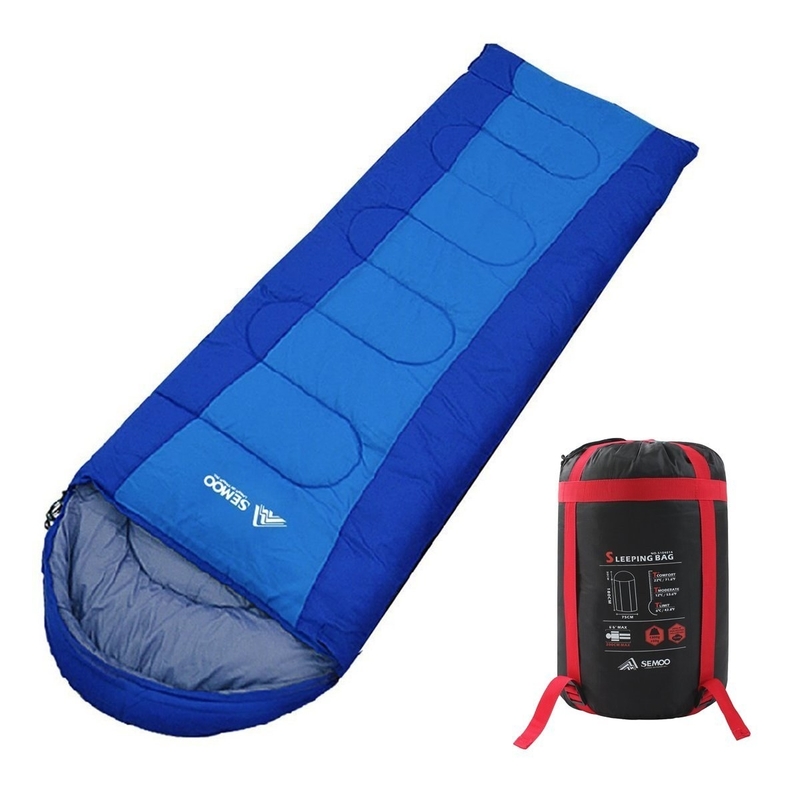 This 22°F sleeping bag comes with a hood, a natural-fit foot box, a zipper draft tube (prevents cold air from leaking in through the zipper), and a stuff sack (a carry bag to stuff the sleeping bag into for storage and transport; a regular stuff sack doesn’t come with compression straps like a compression sack does). The regular size weighs 3 lbs. and can fit a person up to six feet tall. 6. 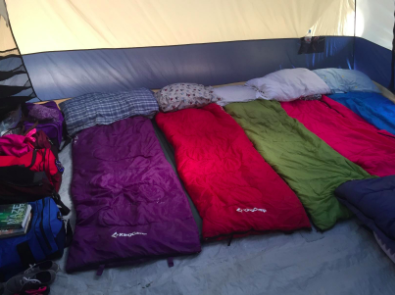 A double sleeping bag appropriately named “Mammoth” that can literally fit an entire family. Don’t let the woods stop you from snuggling. This 20°F sleeping bag is more than enough for a couple to spread out in. It opens up at 94″x62″ (27″x14″ when packed up) and weighs 14 lbs. It has a taffeta shell and a flannel liner. It also unzips on each side AND the bottom for easy access and ventilation. The zipper and shoulder draft tubes keep the cold air out. 7. A spacious and waterproof sleeping bag so you can fully enjoy your five-billion-star hotel experience without feeling damp or constricted. 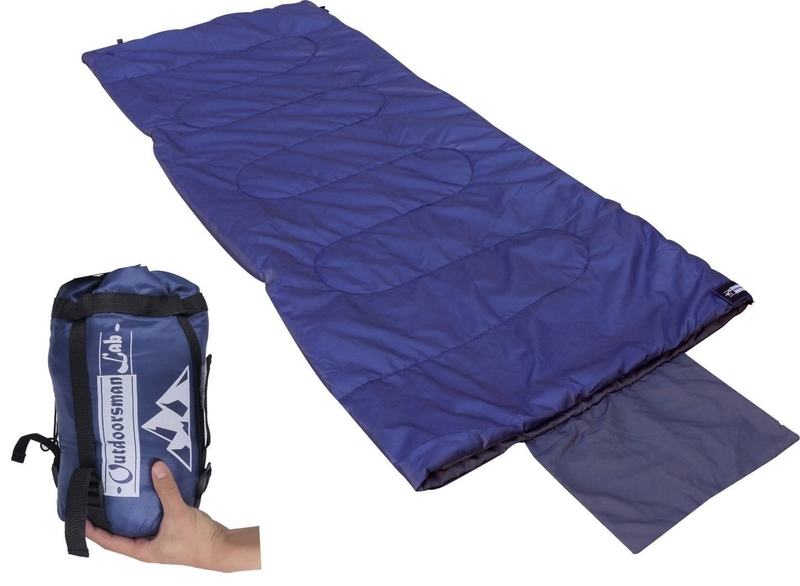 This large sleeping bag measures 88″x34″ when opened (15″x8″x8″ when compressed) and fits adults up to 6’6″ tall! It has a comfort temperature range of 32-60°F. You can unzip it and use it as a blanket. It has a ripstop waterproof shell and an inner storage pocket. It’s machine washable and comes with a compression sack. 8. A spacious sleeping bag (that’s wider and longer than your average bag) to make the experience of zipping yourself into a confined space a little less ~in-tents~. 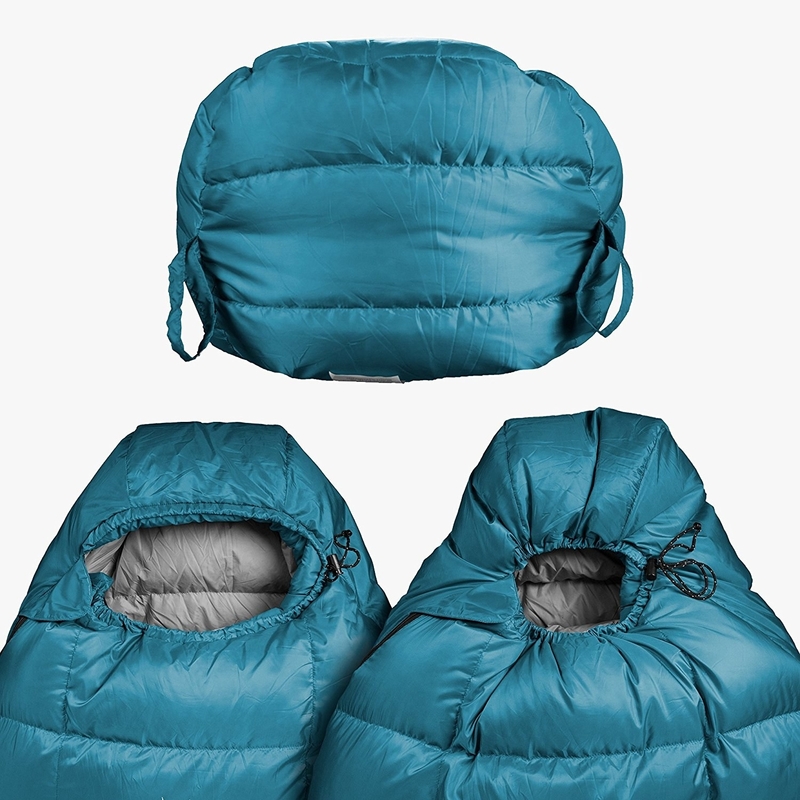 This 25°F sleeping bag opens up to 81″x38″ and weighs 5 lbs. It can be unzipped all the way and used as a blanket. There are plastic roll straps for storage and transport. Promising review: “I am 6’3″ and 350 pounds. I slept in this on a night that it was 40 degrees and was plenty warm in sleep shorts. 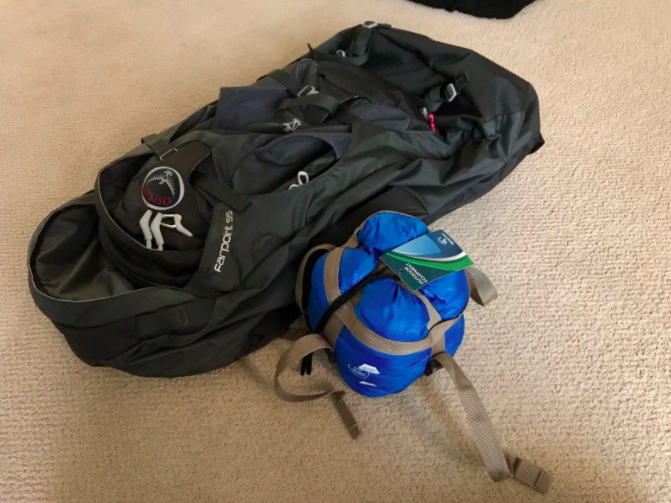 It is BIG, so may not be the best option if you are taking it hiking, but for the price, you cannot beat this sleeping bag for warmth and size.” —James F.
9. A hooded sleeping bag that would work well whether you’re camping outdoors or just at a friend’s house. 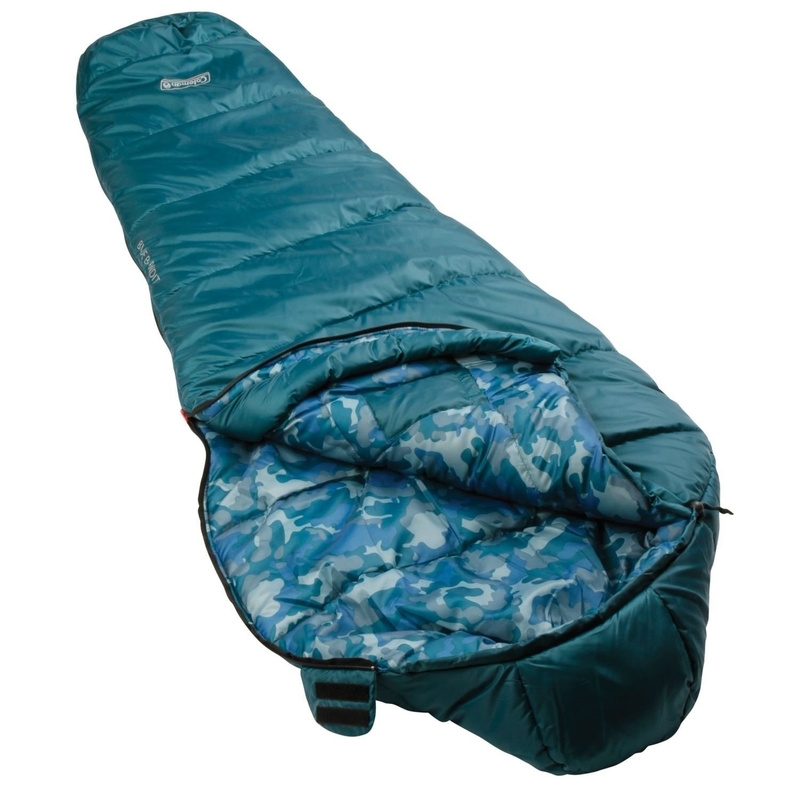 This sleeping bag is best used in a temperature range between 33.8-42.8°F. It has a drawstring hood and can be fully unzipped to use as a blanket. It measures 86.6″x31.5″ when opened (15″x10.6″x10.6″ when compressed) and weighs 4.1 lbs. It comes with a compression sack. 10. A youth sleeping bag (with glow-in-the-dark fireflies on it!!) to burrow in after a round of scary campfire stories. This will keep kids warm even when it’s 45°F outside. It weighs 2 lbs. and opens up to 72″x24″. It comes with an internal storage pouch and a stuff sack. 11. A hooded sleeping bag that’s light on your back AND on your wallet. 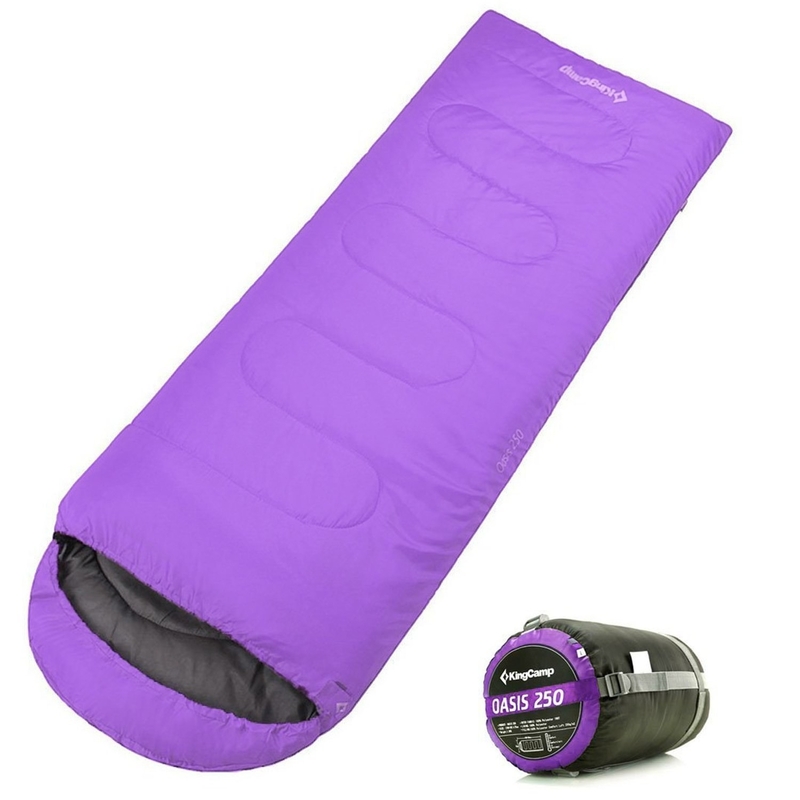 This sleeping bag is designed for a temperature range of 43-72°F. It measures 78″x27″ when opened and weighs 2.97 lbs. You can also unzip it and use it as a quilt. It comes it with a compression sack for easy storage. 12. A plush pizza-shaped sleeping bag you know you ~knead~ in your life. The crust is actually slightly thicker than the rest of the “pizza,” just like on the real thing! There’s a zipper along one side for easy access. It’s machine washable, in case you try to eat pizza in your pizza bag and things get messy. 13. A mummy-shaped sleeping bag to keep you toasty when it’s literally freezing outside. This is one of the warmest bags on this list, designed to withstand temperatures between 0°-10°F! It has a polyester ripstop shell with a polyester liner and filling. It fits adults up to 6’2″ in height and weighs 3.75 lbs. The bottom unzips for extra ventilation on warmer nights. It comes with a stuff sack for storage. 14. A splurge-worthy sleeping bag filled with specially treated down that’s water-resistant and quick-drying. 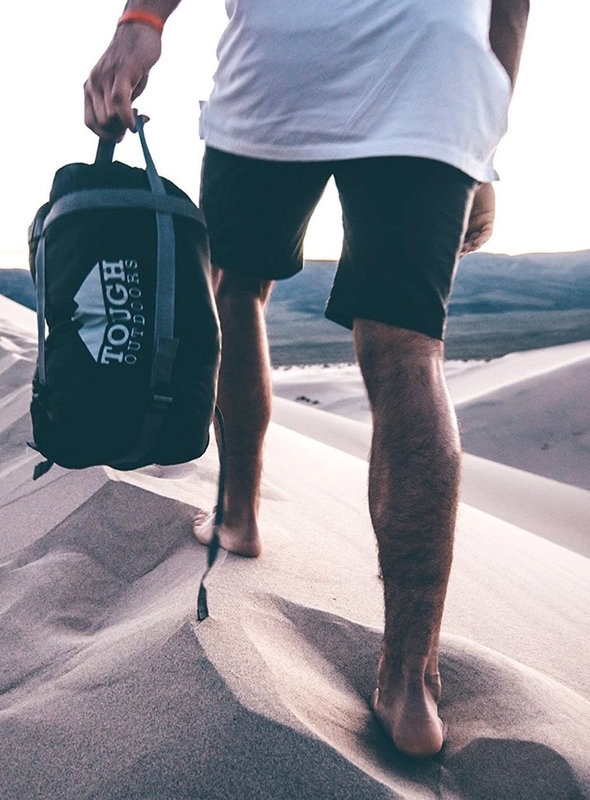 This 20°F bag is insulated with water-resistant 600 fill power DriDown (stays dry longer, lofts better, and dries faster than untreated down). It has a polyester ripstop shell, a polyester taffeta liner, and a zipper draft tube with anti-snag design. The regular-size fits a person up to six feet tall, weighs 2.13 lbs., and can be packed down to 8″x14″ in a stuff sack. 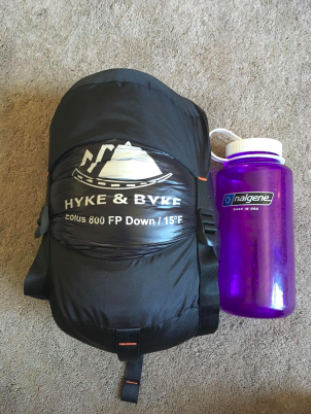 Promising review: “My girlfriend took it on a backpacking trip to Rocky Mountain National Park. We spent the first night comfortably warm in 18-degree weather. We did have a liner and were wearing warm sleeping clothes, but the bag performed wonderfully. The next night it only got down to 25-30 degrees, and she had to vent it a few times to not overheat. Great bag!” —Gavin E.
15. 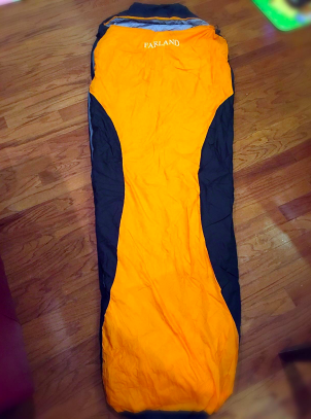 A cleverly designed sleeping bag with an attached pillowcase (you can stuff clothes/towels in it to make a pillow) and elastic straps to grip onto a sleeping pad. This little bag only weighs 1.6 lbs. 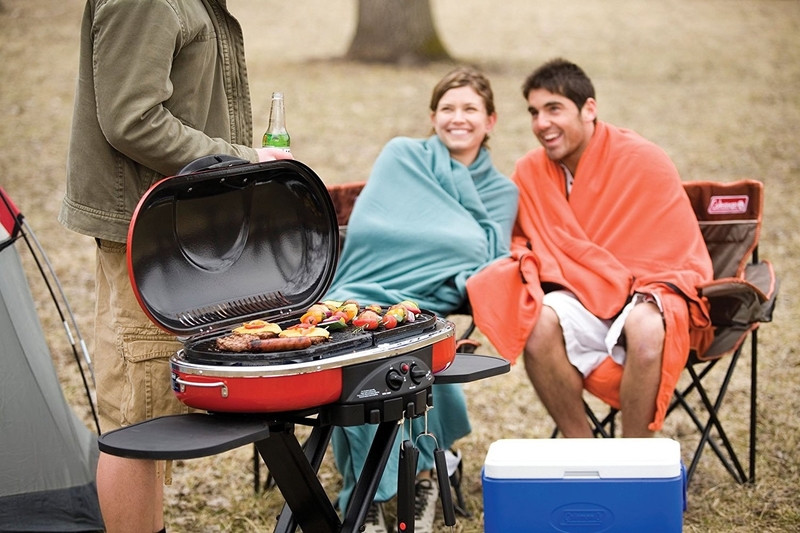 and has a suggested temperature rating of 50-70°F (though it’s best used on warmer nights). It measures 73″x29.5″ when opened (10.8″x5.5″x6.6″ when compressed — roughly the size of a football) and fits people up to 5’11” in height. There’s an inner pocket to stash your valuables, and the shell is water-repellant to keep moisture out. It comes with a compression sack. 16. A mermaid tail sleeping bag that’ll be ~fin-tastic~ for a sleepover or just curling up on the couch. 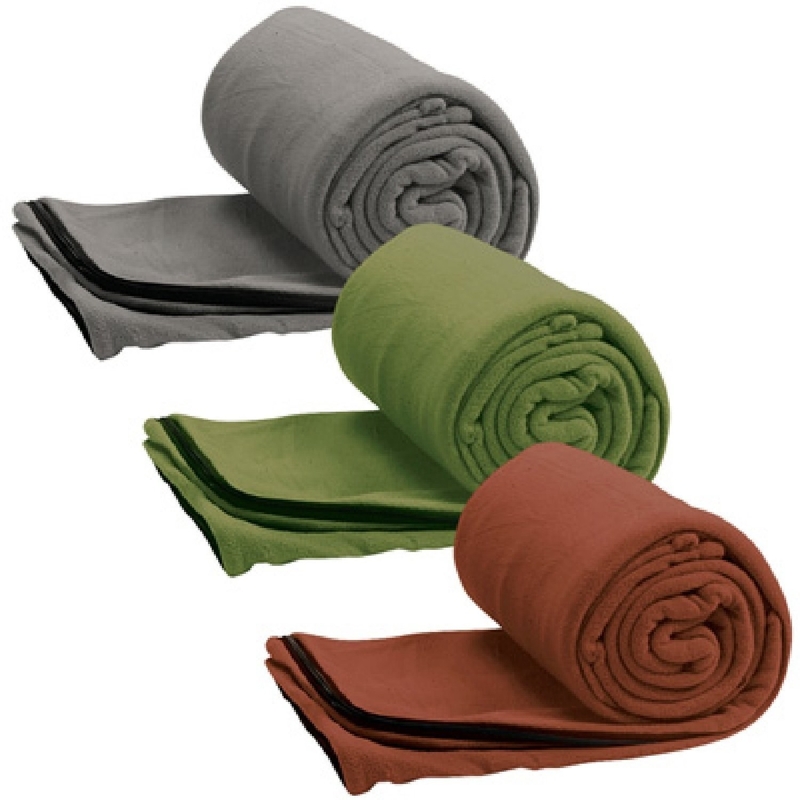 This sleeping bag blanket measures 25.5″ at the opening and 58.5″ in length. 17. 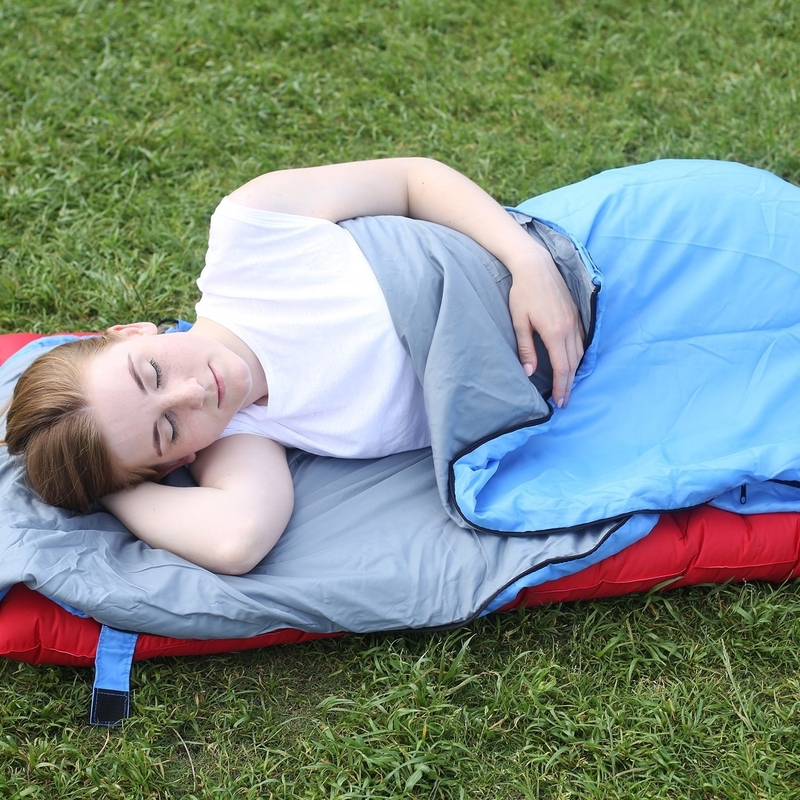 A fleece sleeping bag to use on its own or as a liner in another bag for added warmth. This machine-washable fleece bag will keep you comfortable when it’s 50 °F outside. It’s 75″x33″ when unrolled and is designed for people up to 5’11” tall. As a liner, it adds 12⁰F of extra warmth to another sleeping bag. You can also open it up and use it as a big blanket. A stuff sack is included for storage. 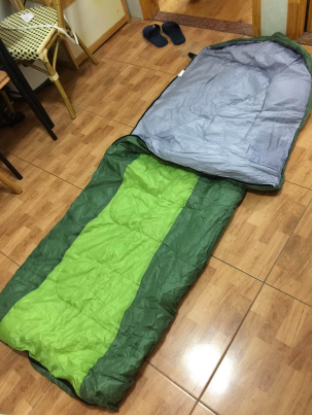 Promising review: “I bought this as a cheap, lightweight option to use alone while backpacking or to pair with my other sleeping bag on cold nights. It is soft, washes well, and because it is fleece, it doesn’t absorb water quickly, so it’s great when it’s a bit wet outside. 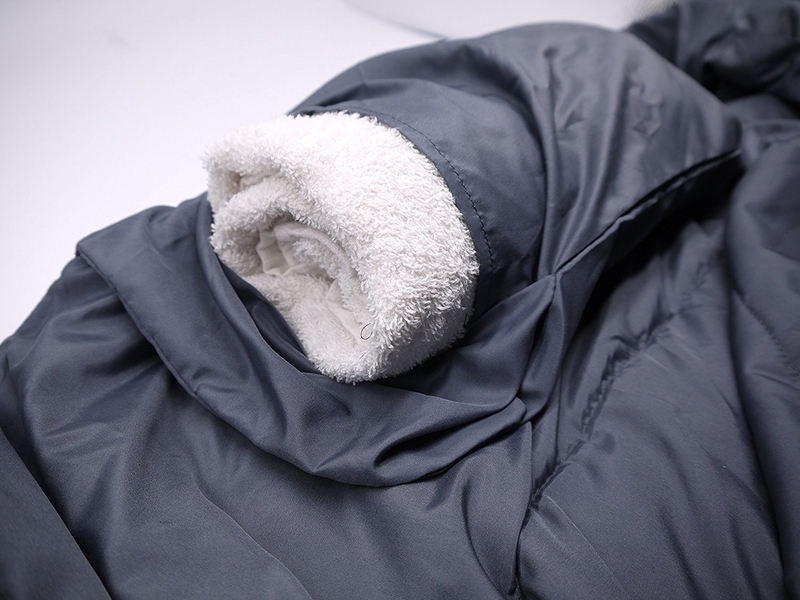 I love the soft feel of the fleece as opposed to the slick lining of a sleeping bag.” —Lauren L.
18. A down sleeping bag with arm openings, so you can read a book or even check social media (IF you have service) without leaving your warm cocoon. 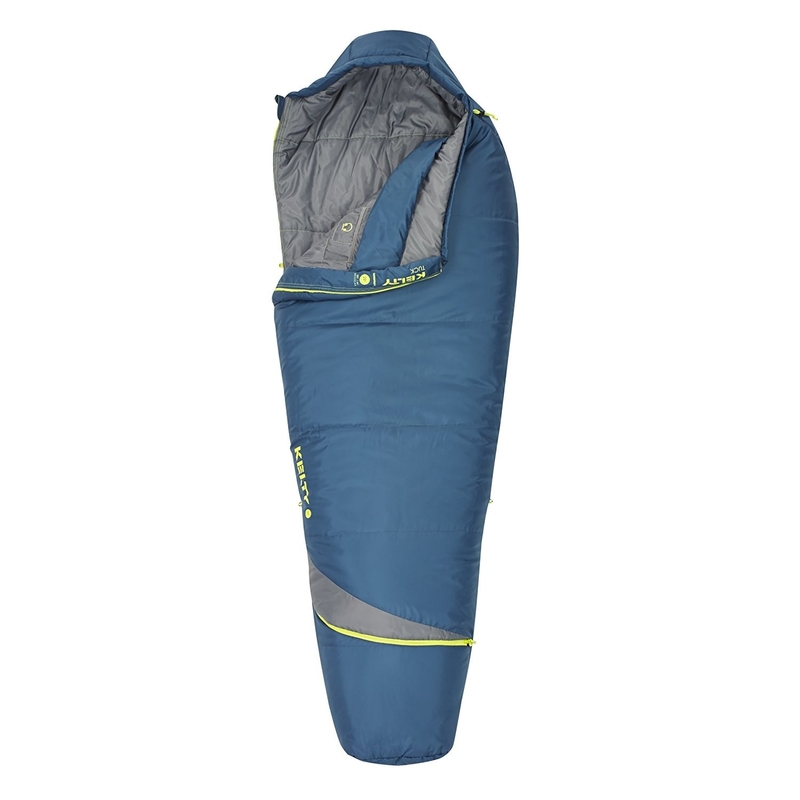 This hooded sleeping bag is filled with 100% duck down and is suggested for use in temperatures above 32°F. It has a nylon shell, polyester lining, and YKK zippers. It measures 82.6″x31.5″ when opened (9.8″x7.8″x3.9″ when compressed) and weighs 2.7 lbs. It can be opened up to use as a blanket. 19. A warm-weather sleeping bag that compresses down to the size of a loaf of bread — perfect for backpacking trips. This lightweight bag weighs 1.8 lbs. and compresses down to 7.9”X4.7″. When opened, it measures 87″x32.5″ and can fit adults up to six feet in height. The suggested optimal temperature is 68°F, though it can be used in a temperature range between 59-77°F. It has a polyester shell and lining and comes with a compression sack. 20. A cute and cozy sleeping bag to keep a young camper as snug as a bug. This mummy-shaped bag is designed to keep kids warm in temperatures above 30°F. It can fit young campers up to five feet tall. There’s an interior tuck pocket to store small items. The bag opens up to 66″x26″ and weighs 3 lbs. It comes with a stuff sack for storage. 21. A waterproof, lightweight sleeping bag that’ll keep you dry even when it’s misty outside. BONUS: it’s actually easy to put back into the compression sack. 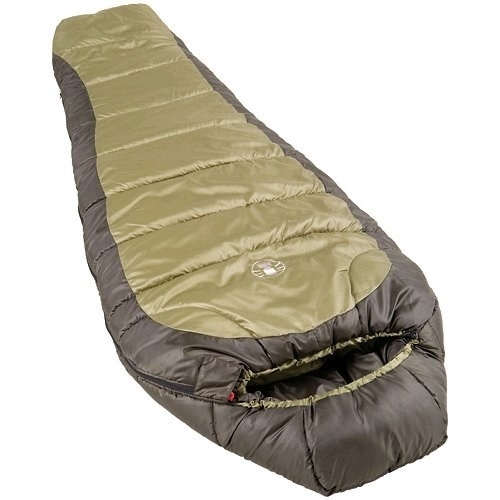 This warm-weather sleeping bag is suggested for use in a temperature range of 59-86°F. It measures 83″x33″ when opened (5.9″x7.7″x15″ when compressed), fits campers up to 5’11” in height, and weighs 2.4 lbs. The shell is made of nylon, while the lining and filling are made of polyester. It comes with an inner storage pocket for valuables and a compression sack. 22. A cotton-flannel-lined sleeping bag so comfortable, you won’t miss your bed at all. 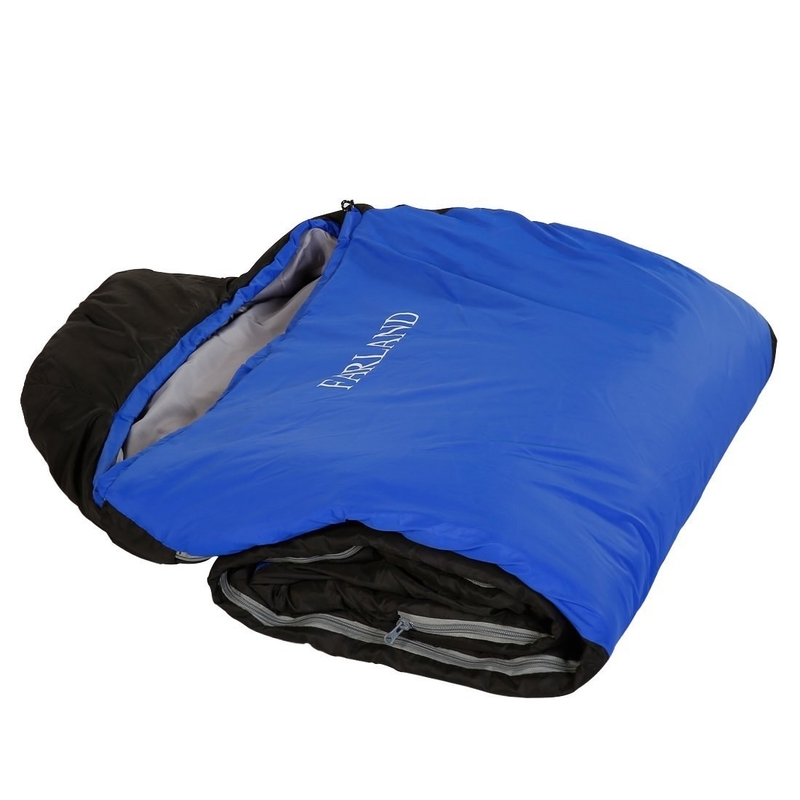 This rectangular sleeping bag is ideal for cool weather camping where the temperature range is between 30-50°F. It has a polyester shell with a 100% cotton liner and is machine-washable. When opened, it measures 33″x75″ (16.54″x9.45″x16.54″ when rolled up) and fits heights up to 5’11”. It’s on the heavier side, weighing 5.55 pounds. 23. A massive, super-comfy sleeping bag that’ll tempt even a non-outdoorsy person to give camping a go. 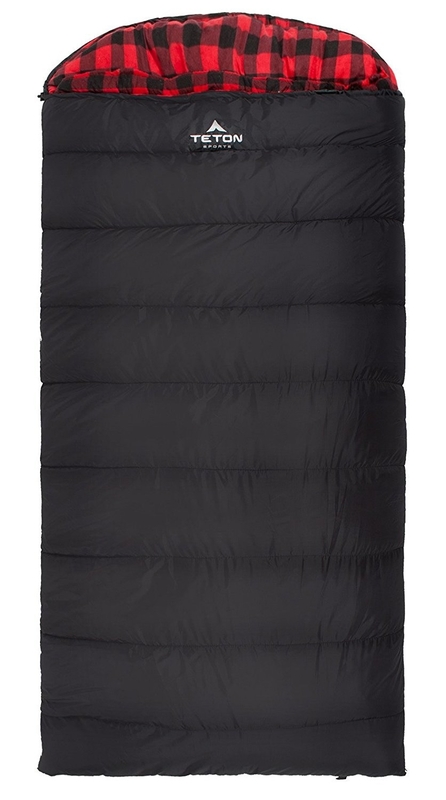 This hooded rectangular sleeping bag weighs 7 lbs. and is best used for car camping, because it probably won’t fit in your backpack! It opens up to 90″x39″ (17″x12.5″ when packed) and can be used in temperatures as low as 0°F. The bag has a taffeta shell with a poly-flannel lining that feels like bed sheets. 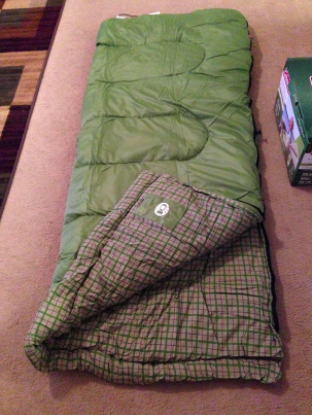 Promising review: “I am so happy with this sleeping bag! For starters, I am 6’4″ and weigh 305 lbs. My shoulders are probably 26″ wide, and I toss and turn all night. Most bags leave me feeling like I am going to be strangled but not this guy! I tossed and turned all night and had so much room, I felt like I was sleeping in my regular bed. Not to mention how warm I was. So happy; I will definitely tell all my friends to get this!” —Jacob C.
24. 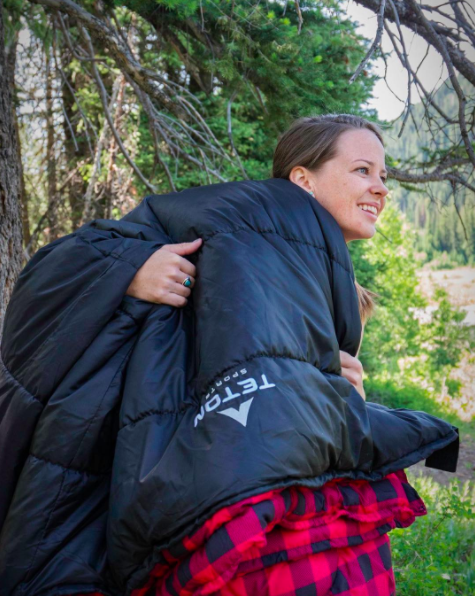 A wearable sleeping bag so you don’t have to sacrifice mobility for warmth. Bonus: you’ll get to look like an astronaut. This wearable sleeping bag has zip-off booties, so you can wear your own shoes when moving around. There’s a kangaroo-style pocket in the front (so you can rest your arms and store your stuff) and leg vents that can be unzipped when you get too warm. It’s great for people who feel claustrophobic in regular bags. 25. A heavy-duty sleeping bag that won’t weigh you ~down~. It’s warm, compact, and just a friggin great deal. 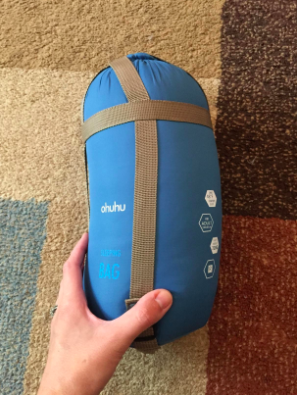 This down sleeping bag only weighs 2.87 lbs. (3.1 lbs. for long-size), but it’s designed to keep you warm in frigid temperatures between 0-15°F. It has a ripstop nylon fabric liner with two YKK zippers. When opened, it measures 78″x28″ ( 9″x6.5″ when compressed). The regular size fits heights 6’1″ and below. It comes with a compression sack.